Offense: Injures and the Ryan Braun suspension disrupted the Brewers offense a year ago, but this season they should be improved. Finding a new effective leadoff man will be key early on in the year, after trading away one of baseball’s top leadoff hitters in Norichika Aoki this offseason. One thing is for sure though, with the return of Braun, and a healthy Aramis Ramirez, along with Khris Davis, Jean Segura, Carlos Gomez and Jonathan Lucroy, the Brewers lineup should be dangerous. If the Brewers middle of the order can stay healthy for an entire 162 game schedule, the Brewers have the potential to possess one of the highest scoring offenses in the National League. Rotation: All the talk this offseason surrounding the Brewers was their signing off veteran right-hander Matt Garza to a four-year deal worth $50 million. The addition of Garza now solidifies the Brewers starting rotation, and gives them a potent one, two, three punch. Yovani Gallardo will get the Opening Day nod followed by Kyle Lohse, Garza, Marco Estrada and young fire baller, Wily Peralta. Tyler Thornburg will be coming out of the bullpen after starting seven games in 2013, while having a 1.47 ERA, but he will be the first arm used in the starting rotation if need be. Bullpen: After going from a league-worst 4.66 ERA in 2012 to the fifth-best ERA at 3.19 last season, the bullpen looks to continue their success. Jim Henderson will be given the ninth inning duties, compiling 28 saves in 2013, and Francisco Rodriguez and Brandon Kintzler will bridge the gap from the starters to Henderson. Offseason acquisition Will Smith, Rule 5-pick Wei-Chung Wang, and veteran Zack Duke start the season as the lefties in the pen. Tom Gorzelanny will start the season on the disabled list. Players to watch: All offseason the goal was to add more power to the starting lineup, and the Brewers are putting all their faith in powerful young left fielder, Khris Davis. At only 26 years old, he has the potential to hit 20 plus homeruns, but one negative to Davis is his tendency to strikeout a ton. Another player to watch is hurler Wily Peralta. In his rookie season he was inconcistent, but showed flashes of being top of the rotation material. He will be key to the rotation’s success, and the Brewers cannot afford to have him get off to a slow start again this season. Possessing a fastball that reaches near a 100 miles per hour, Peralta has the arm to be a star, now he just needs to put it all together to have a big year. Why they will win/lose: Health was not on the Brewers’ side a year ago, but if they can remain healthy this season, they will be a dark horse contender in the National League Central. Pitching wins in baseball, and if their starting five can live up to their potential, they are just as good as any other team in their division. If they do not stay healthy, they will once again finish in fourth with close to 85 to 90 losses. It is hard to imagine the Brewers having as much bad luck as they did last season, but if they do, you could see a shake up in the front office at the end of the year. Final thoughts: No one is giving Milwaukee a chance to compete in the NL Central with the St. Louis Cardinals, Pittsburgh Pirates and Cincinnati Reds, but they will be in the division race until the end. If they can stay healthy, and Ryan Braun returns to a productive form, their offense will be dominant. The addition of Garza will be huge as he provides the Brewers with a fierce competitor, who has a passion for winning. 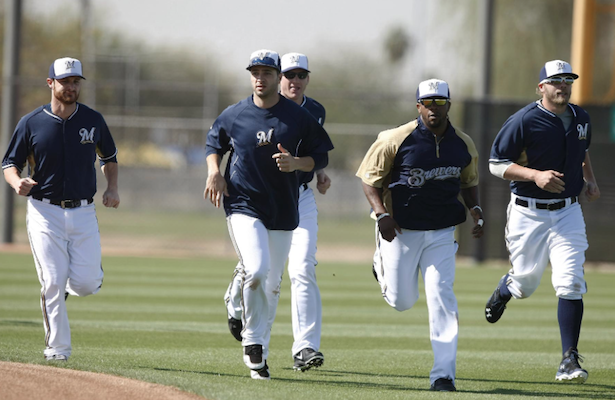 It will not be easy, but do not be surprised if you see the Brewers competing in October.